The new ‘Plugged-In Places’ scheme could see thousands of charging points set up in streets and car parks around the UK for electric cars and plug-in hybrids. 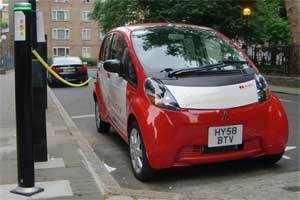 The initiative is intended to support the development of between three and six electric car cities and regions across the UK. These will act as ‘trailblazers’ for electric car technology, and help shape future development of a national charging infrastructure. The Government has set aside £30m in funding to establish these Plugged-In Places. Cities and businesses are being urged to join together to bid for the money, which will help finance the installation of charging points in places such as car parks and streets, but also commercial, retail and leisure facilities. Successful bidders will be expected to match the Government’s contribution. The total number and location of the new Plugged-In Places will depend on local plans and requirements. The £30m is part of a larger investment of ‘around £400m’, which the Government is setting aside to encourage the development, manufacture and use of ‘next generation ultra-low-carbon vehicles’. Administrated by the Office for Low Emission Vehicles, this should help create new UK jobs as well as reduce the threat to our environment. Launching the Plugged-In Places initiative, Transport Secretary Andrew Adonis said: ‘The UK can be a world leader in electric cars and low carbon cars. ‘The move to lower-carbon forms of transport is a turning point for the automotive industry, opening up new opportunities for existing UK automotive companies and with the potential to create new jobs and new industries, for example around the charging infrastructure. In addition to the new Plugged-In Places initiative, the Government has also announced that seven other schemes will benefit from £500,000 in funding through the Alternative Fuels Infrastructure Grant Programme. This will see 72 electric charging points and four gas refueling stations set up in areas across England. The Which? Car team is on Twitter, to offer you help and advice as and when you need it. We’re monitoring our Twitter account every day, so if you have an account, please send us you thoughts and questions to @whichcar. Don’t worry if you haven’t got a Twitter account – you can still stay in the loop by regularly checking www.twitter.com/whichcar.